"Parker, get the Rolls Royce. We're going for a little ride!" 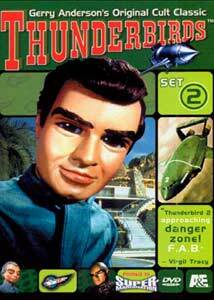 Ready for more Thunderbirds action? Well, you better be, because Set #2 brings us another 6 episodes of the "F.A.B!" team of International Rescuers. In this set, we see more of London agent Lady Penelope, more of The Hood, and more of the Thunderbirds doing their best to thwart disaster in "SuperMarionation!" We find Lady Penelope breaking into the Bank of England in this episode. Why? To prove how weak their security is. Once the bank gets a better vault installed, a stubborn, workaholic banker gets stuck inside. Time for a brave rescue! Rating: 4 out of 5 Thunderbirds. This episode functions as something of a sequel to the first episode, Trapped In The Sky. Once again, Fireflash planes are flying, but now they keep crashing. Is someone sabotaging them again? The Thunderbirds check it out, by daring to crash one themselves! Alan Tracy and Grandma Tracy are trapped on top of a bridge by a bomb that will go off if they move! International Rescue comes to aid their comrade, and while they fly there, there's just enough time for Alan to have a flashback about how he got up there in the first place. They certainly weren't base jumping! The Hood finds himself as the head of a production studio. He funds a project to make a movie about Martians invading the Earth, but he is really just luring International Rescue out again and trying to discover the secret behind their advanced craft. Is this how ID4 got off the ground? The Thunderbirds investigate a fraudulent transport developer, but in the process, they get themselves mixed up in one of his schemes. They board one of his faulty monorails and must be rescued from certain death. No, this episode isn't about how hard it is to be Lady Penelope's butler; it's about her attempts to locate a missing scientist. Penelope takes the spotlight above the Thunderbirds here, as she winds up kidnapped by mysterious fiends! Image Transfer Review: Nothing has changed much from the quality of Set #1. While a bit damaged in some areas, the episodes are very clear and free of pixelation or artifacting. The colors are a little faded, but otherwise everything seems intact and the transfer has preserved the "Thunderbirds look" without incident. Audio Transfer Review: The same quality audio mixes are present again. The 2.0 Surround mix provides a slightly beefed-up enhancement to the original way the show sounded, whereas the 5.1 mix adds some major directionality, active surround usage, and major LFE channel boosts. As with Set #1, both mixes sound very good (the 2.0 being more faithful to the original mono), but the 5.1 can sometimes get a bit too loud, with explosions and other sound effects often being much louder than the standard level. Oddly enough, a few of the episodes here don't have 5.1 audio during the introductions anymore, but the episodes themselves are fine. Extras Review: Each disc contains a photo gallery of stills taken from each episode (and sometimes other episodes). The Behind-the-Scenes featurette is the same 3-minute piece that appeared on Set #1, which is kind of disappointing. I'm sure that plenty of features have been made about Thunderbirds, especially considering how wildly popular they are in England. So, the repeated short is a bit of a downer.